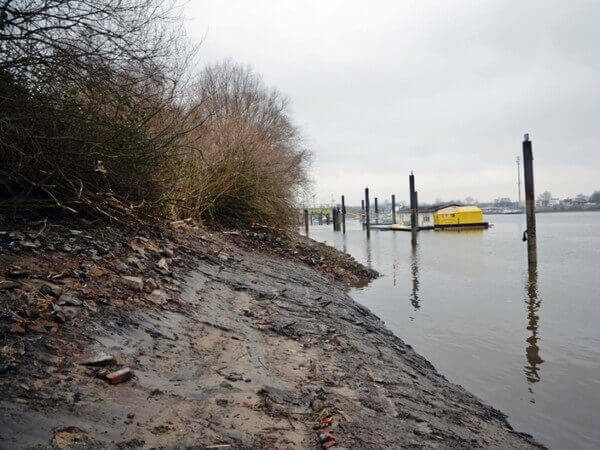 Seeking to enhance the ecological status of the Tidal Elbe, the Free and Hanseatic City of Hamburg pursued an innovative path in 2010. It established the Elbe Habitat Foundation. For the first time, the eleven-strong Foundation Board of Trustees enables representatives from the city, Hamburg Port and environmental organisations to combine their expertise and reach joint decisions on concrete actions with the aim of ecologically enhancing the Tidal Elbe. Financial resources were allocated to the Foundation, enabling it to maintain, improve or, in many cases, restore the habitats of animal and plant species typical of the Tidal Elbe. The Elbe Habitat Foundation is committed solely to its objective of enhancing the ecological status of the Tidal Elbe. Consequently, it is explicitly not an instrument of the City of Hamburg for implementing legally required compensation measures. The bodies of the Elbe Habitat Foundation are the Managing Director and the Foundation Board of Trustees. The measures adopted by the Foundation Board of Trustees are implemented by the Managing Director together with the Business Office. Watch the movie about the Elbe Habitat Foundation. Download our flyer. The Tidal Elbe is the 148 km stretch of the Elbe before it flows into the North Sea. It starts at the weir at Geesthacht, flows through the metropolitan region of Hamburg and drains into the sea at Cuxhaven. The distinguishing feature: thanks to the large estuary and the strong influx of fresh water from the Elbe, a unique natural area has formed governed by the tides. The area is home to an abundance of plants and animals – for example, it is the only place in the world where the Elbe Water Dropwort (Oenanthe conioides) exists. Not only is the Tidal Elbe a special natural area – it is also a major economic artery for an extremely flourishing cultural and economic area. It connects the metropolitan region of Hamburg and its 5.3 million inhabitants (2017) and Europe’s second largest port to the rest of the world. Embankments, flood barriers and the repeated deepening of the river have changed the tidal dynamics of the Lower Elbe. The tidal range is increasing, river banks are silting up, and the proportion of shallow water zones – important spawning grounds and refuges for fish – has fallen sharply. In summer, the oxygen content in the water often drops below the minimum level that fish need to survive. 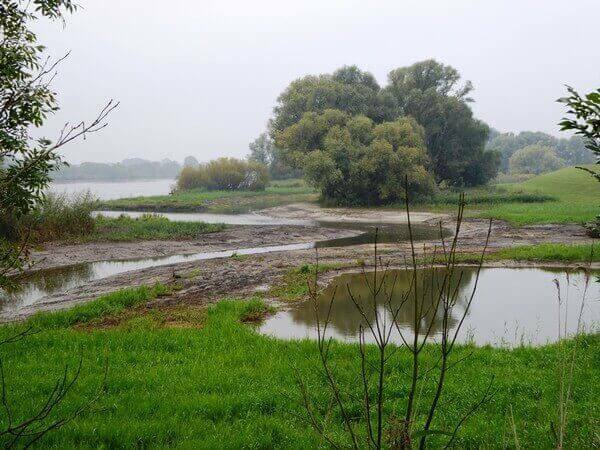 The habitats of other animals and plants are also at risk: in many places, enormous bank protection systems inhibit local dynamics – the basis for developing species and habitats that are typical of the Elbe. The Elbe Habitat Foundation seeks to enhance the ecological status of the Tidal Elbe, to preserve the natural diversity, and to strengthen the unique habitats of the river landscape. 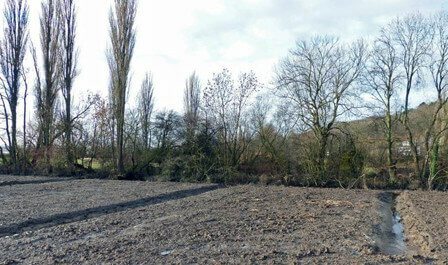 We are making the banks and dyke foreland more natural, providing a home for many plants and animals. We support the development of essential shallow water areas. We improve tributaries or reconnect them to the main river. We preserve and develop the ecological value of species-rich and biologically productive tidal flats. We encourage the development of natural dynamics. We finance and implement our own actions and promote external projects so as to enhance the ecological status of the Tidal Elbe. 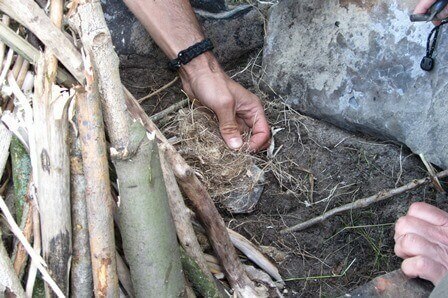 We also engage in educational work, information activities and public relations for the Elbe habitat. In order to achieve our objectives, we also acquire sites where we can implement measures. Examples of projects carried out by the Elbe Habitat Foundation are presented below. If you wish to find out more about the Foundation and its activities, please do not hesitate to contact us. Since its creation by humans in the 1930s and 1940s, Neßsand has been able to develop almost undisturbed. The area features not only dense, thick alluvial forest with tidal creeks, impressive reed beds, mudflats and sandflats, but also sand dunes, arid grassland and shallow water zones – i.e. a tiny area in which virtually all habitats of the Tidal Elbe come together. The island is one of the richest natural treasures of the Tidal Elbe. And yet small water bodies, which are actually typical for floodplains, are lacking on Neßsand – and also along the entire Tidal Elbe. 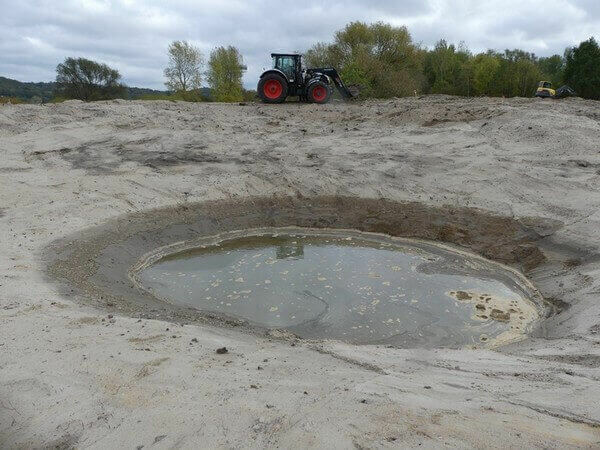 By creating marshy pools, the Elbe Habitat Foundation seeks to foster the existence of the last valuable habitat that is missing on Neßsand. 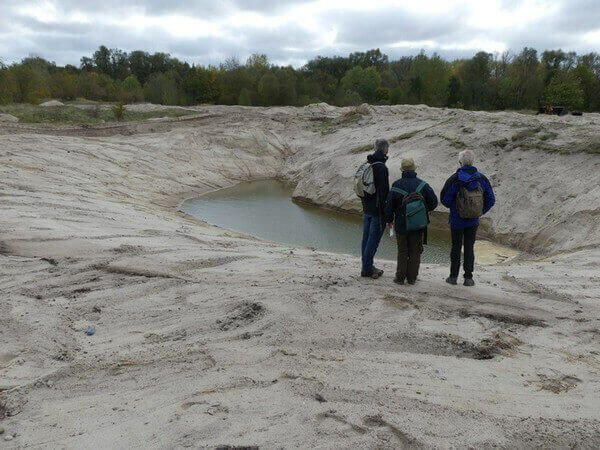 To help achieve this, around 30 new water bodies and wet hollows of different sizes and depths were constructed in autumn 2018. Furthermore, by clearing sea buckthorn, space was created for valuable arid grassland, which had been severely displaced in recent years. These new small water bodies are ideal places for amphibians such as the common toad, dragonflies and other insects to settle. This rare arid grassland on Neßsand, protected by law, is home to Red List species such as Blue Hair Grass, Dense-Flowered Mullein and the Carthusian Pink. Species able to find food here include the bow-winged grasshopper and the small copper. Dyking of the Elbe island Wilhelmsburg has been occurring gradually since the Middle Ages. Today, only very little dyke foreland is left on the Norderelbe. The banks of this anabrach are massively fortified with rock-fill. 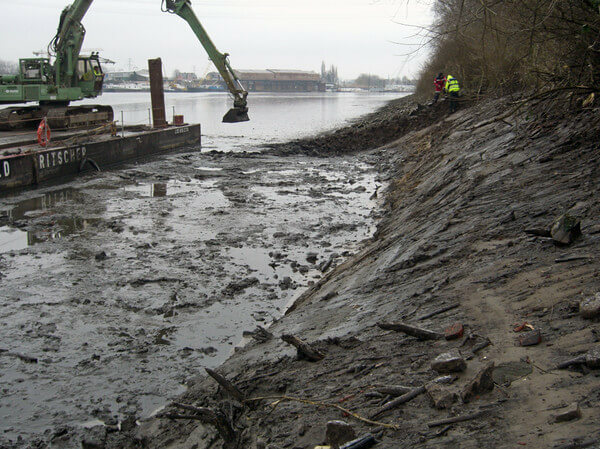 Most of the area between the dyke and the Elbe is filled with dredged material. As a result, tidal influence is heavily restricted, leading to the loss of valuable habitats. This phenomenon also occurred on the Obergeorgswerder foreshore. 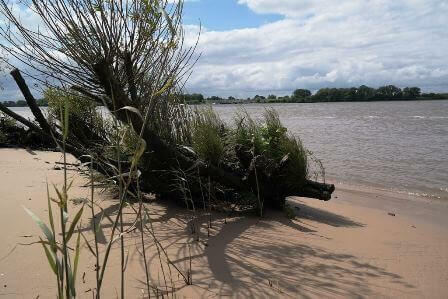 Here, the Elbe Habitat Foundation has created two new tidal creeks and a small water body. The tidal creeks provide a new habitat for the Elbe Water Dropwort, an endangered species. Less than a year after the tidal creeks were completed, around 50 plants had already become established. 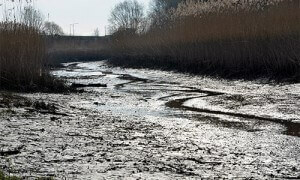 These measures have also resulted in the extension of the habitats of numerous Elbe fish and of the nearby marsh frog. 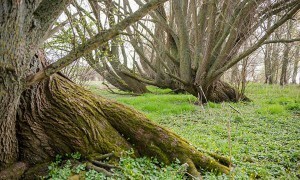 A new natural area has evolved that is diverse and vital. Watch the movie about this project. The hard bank fixation shapes large parts of the Tidal Elbe, considerably restricting natural shore dynamics. This prevents the natural zonation of the riparian vegetation and, for instance, the development of pioneer sites, which are typical of tidal rivers. 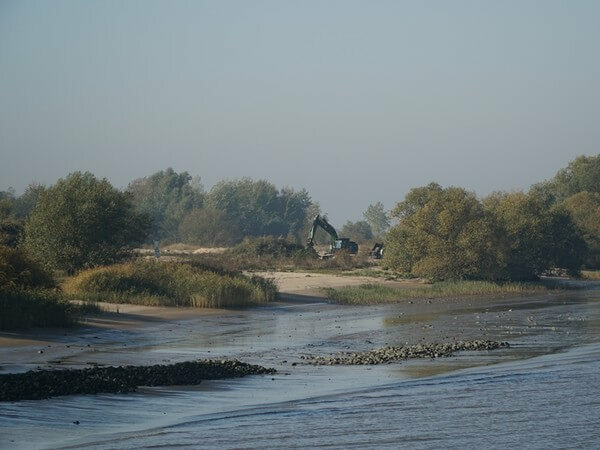 In a bid to make the banks more natural, the Elbe Habitat Foundation dismantles bank reinforcements, wherever coastal protection is not impeded. 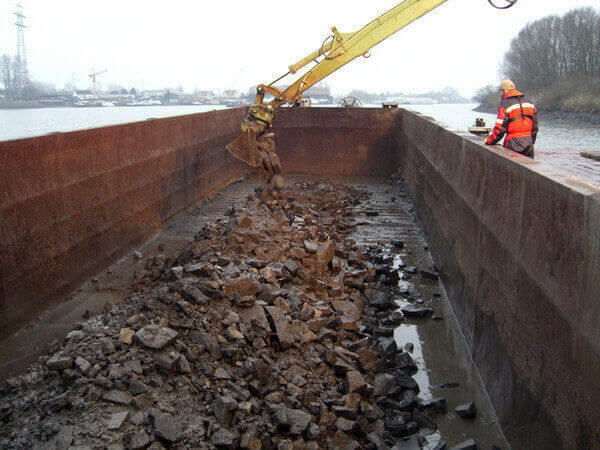 For example, the Foundation has dismantled a 250 m stretch of the stony revetment of the Elbe island Kaltehofe, located at Hamburg Port. The Foundation has also lowered the revetment at several places near Juelssand, Schweenssand and on the island Rhinplate. Under tidal influence, the bank is now able to develop more naturally along these stretches. The tidal creek was supposed to provide important resting, feeding and spawning grounds for lampreys and fish such as asp and common bream. However, this was not the case: a riprap at the inlet area of the tidal creek prevented them from returning to the Elbe at low tide, creating a trap for fish, especially on hot days. The endemic, endangered Elbe Water Dropwort was unable to find favourable habitat conditions here, even though it was the plant’s traditional habitat. 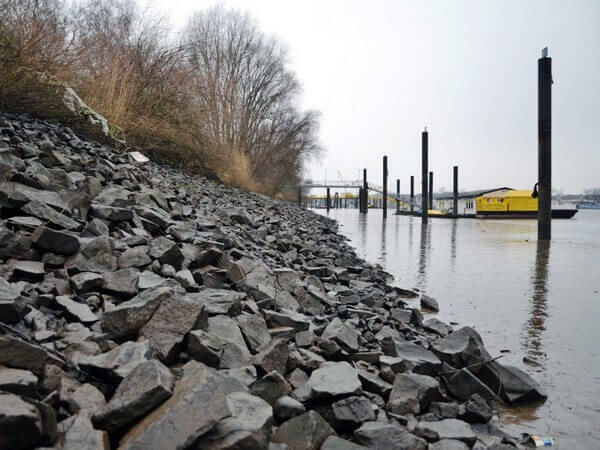 In April 2014, the Elbe Habitat Foundation had the riprap at the inlet area of the tidal creek dismantled. Since then, fish and other aquatic organisms have been able to return unimpeded to the Elbe from the tidal creek, even at low tide. In a bid to increase the habitat of the Elbe Water Dropwort, the Elbe Habitat Foundation intends to create another tidal creek here in 2019. The revetment is to be reduced carefully to a width of 30 m to enhance tidal influence. Watch the short film about the project. Species-rich wet meadows are typical habitats along the Tidal Elbe. There are very few of them left today. Almost everywhere, the construction of dykes meant that marsh grassland, which had previously been flooded periodically, became separated from the river. 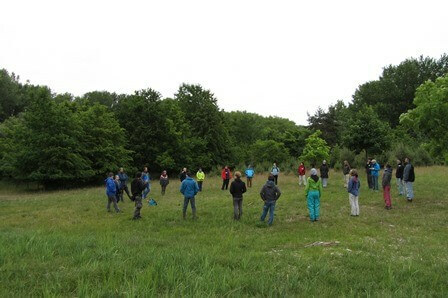 In the nature reserve “Wittenbergen”, the remaining wet meadows along the Elbe were extended, enlarging the habitat of the rare Snake’s Head Fritillary and other species. 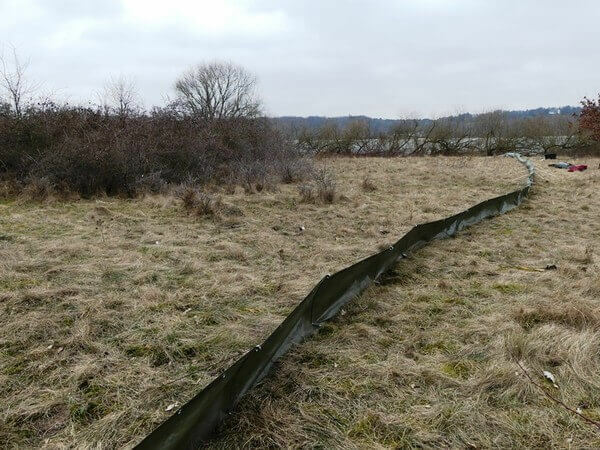 To achieve this, a former Hamburg Port Authority (HPA) spoil area was excavated to the level of the adjacent Snake’s Head Fritillary meadow in 2015. Here is a short film about the project. 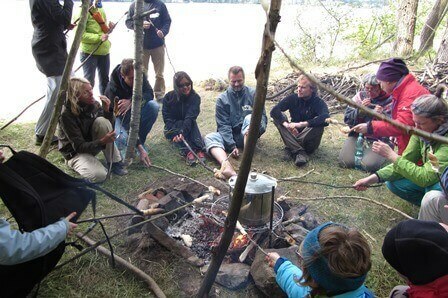 In 2014 and 2015, the Elbe Habitat Foundation organised “Wilderness Camps” on the Elbe island Hanskalbsand, enabling interested participants to gain a thorough and vivid insight into the issue of the Tidal Elbe. Their special discovery of the Elbe involved enlightening short presentations on the unique fauna and flora by the Foundation’s staff, building water filters and a night walk. Unforgettable memories of an adventure in the “wilderness of the Elbe” were created: impenetrable common reed, winding tidal creeks, a spectacular sunset and – last but not least – a relaxed group experience. This is just one example of the Foundation’s various own activities. 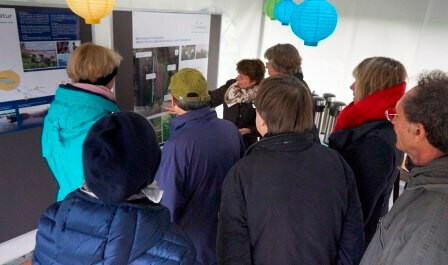 The Elbe Habitat Foundation also furthers its educational work and information activities about the habitat of the Tidal Elbe by supporting several external projects. 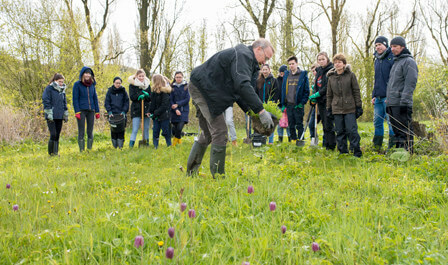 In 2017 and 2018, the “ElbForscher” project was offered to young people wishing to play an active role in enhancing habitats at the Tidal Elbe. 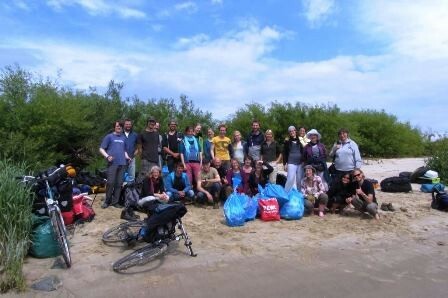 To mark the worldwide Coastal Cleanup Days, workshop camps were held at the Falkensteiner Ufer at the Elbstrand. 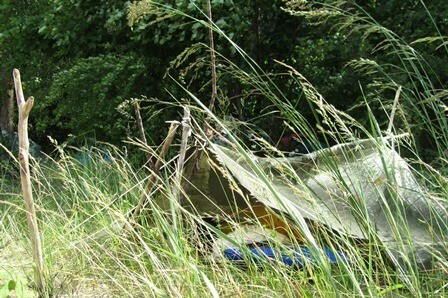 These camps were an ideal platform for young people to find out all about river protection. 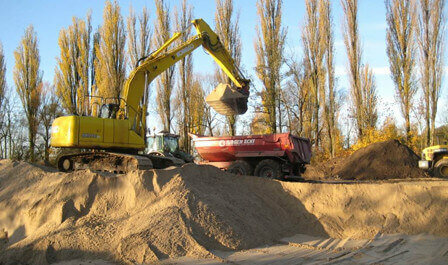 The Elbe Habitat Foundation supports this project. The topics addressed by the 60 or so young people who attended the camp in September 2018 included everyday waste prevention; the impact of ocean plastic pollution; and recycling systems and waste management. 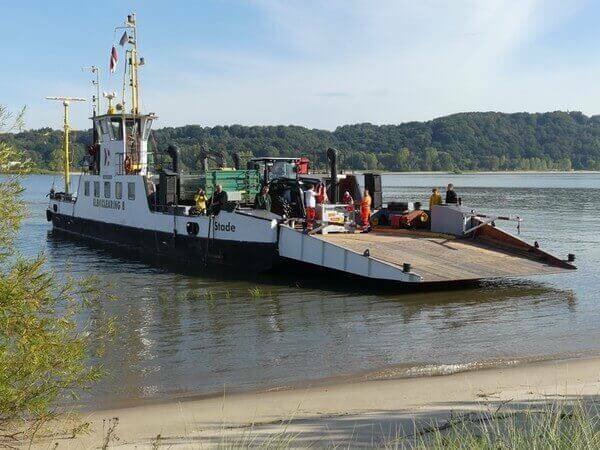 Also, in the space of a few hours, they collected 1,241 kg of waste from the Mühlenberger Loch nature reserve, the Falkensteiner Ufer and the Elbe island Pagensand. 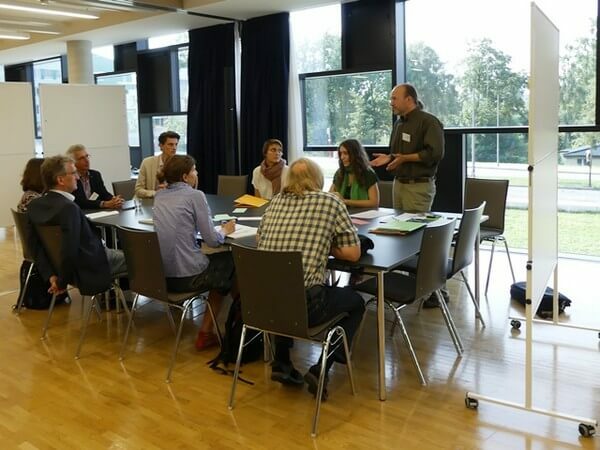 Besides hosting camps for young people, the aim of the project is to foster regular cooperation with schools so as to raise pupils’ and teachers’ awareness of the Elbe habitat. In its day-to-day work, the Elbe Habitat Foundation addresses all kinds of legal, planning and scientific issues and challenges. For this reason, it engages in lively technical discussions with other experts of tidal river management, nature conservation and species protection, and also organises informative events and workshops. 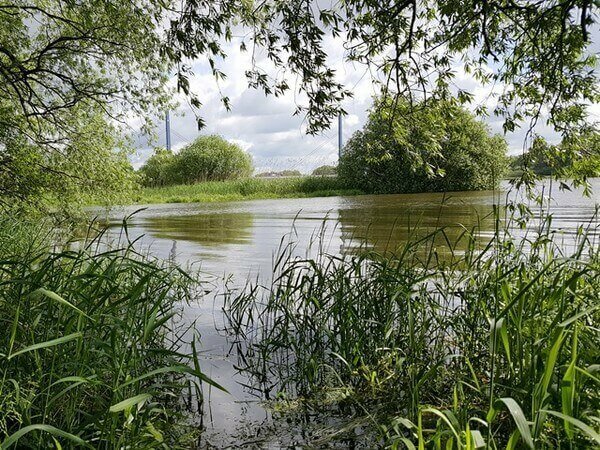 One of the specialist events organised by the Foundation in 2018 focused on the Elbe Water Dropwort. Experts from three federal states met in Hamburg in March 2018 to share their knowledge and experience on how to preserve this endangered species. 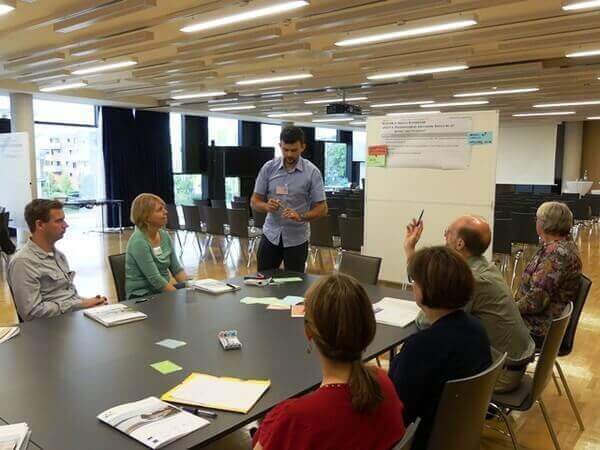 In 2016, the Foundation organised an international workshop on “Embracing Estuaries − Management of Natura 2000 sites in Estuaries and Sea Ports”. The main aim of the two-day workshop was to promote technical dialogue between researchers, practitioners and policymakers. The Elbe Habitat Foundation is continuously developing new projects to support the protection and preservation of Tidal Elbe habitat. One example of a project that is about to start involves enhancing Luhe near Harburg as an area of habitat and recovery. From autumn 2019, the habitat conditions for species in flowing water, such as otters and sea trout, are to be improved. 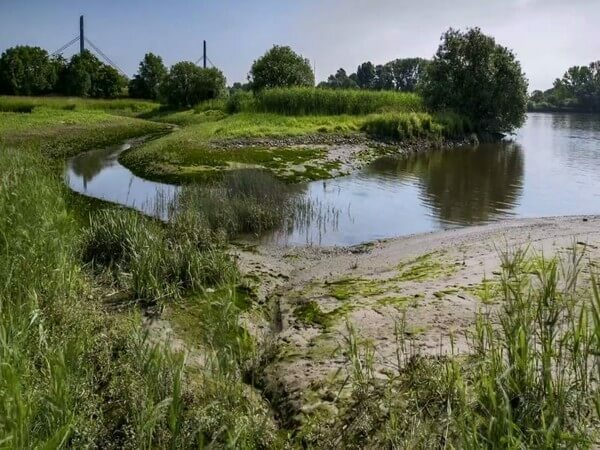 Together with Wedel Town and the District of Pinneberg, the Elbe Habitat Foundation is also discussing how to enhance the Wedeler Au and its tidal backwaters downstream from Wedel Town. 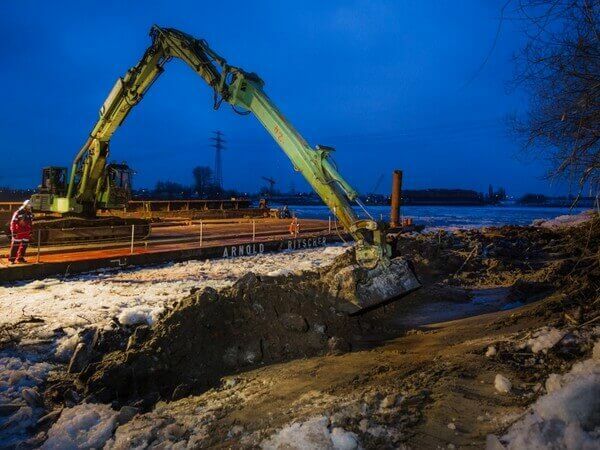 Considerations focus not only on the flattening of banks and installation of tidal creek systems, but also on the creation of marshy pools and the removal of pipe culverts. 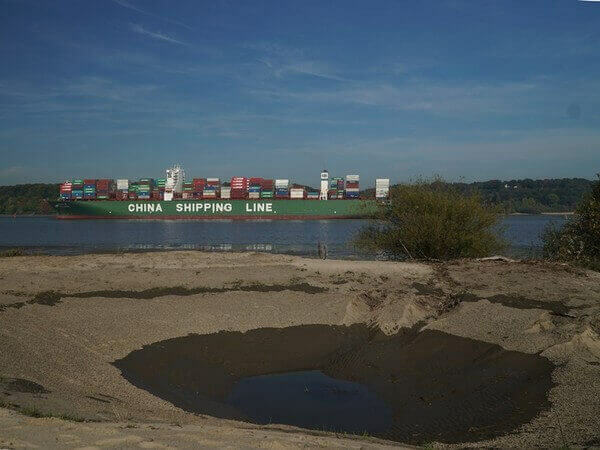 A feasibility study for this project has already been completed; the Elbe Habitat Foundation now has to coordinate its implementation with the authorities. 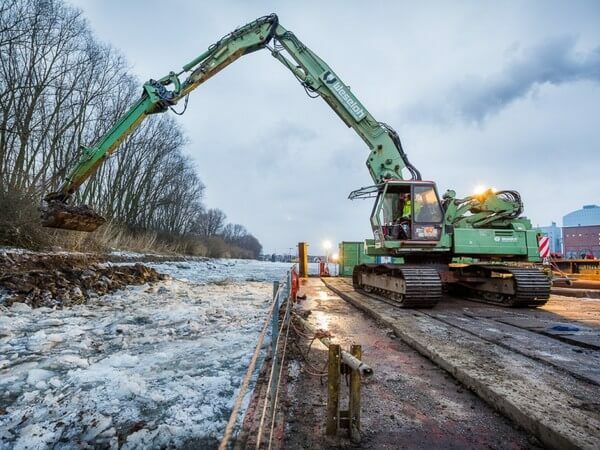 Investigations are also be carried out at Geesthacht Weir to establish whether dyke foreland on the south bank would be suitable for conversion into a near-natural water system. This development would enable diverse tidal and alluvial habitats to evolve.